I know, it’s March, not February. So I’m a little late. I cooked my selections for Cottage Cooking Club in February, but didn’t plan my time well enough to write my recap post until today. For the past seven months, I’ve joined Andrea of The Kitchen Lioness and a bevy of other home cooks to try out recipes from British chef Hugh Fearnley-Whittingstall’s cookbook, River Cottage Veg, under the umbrella of the Cottage Cooking Club. I tried out three recipes in February, though many of Andrea’s choice of recipes looked tempting. These were all I could fit in. First, I made Potato Rösti, the Swiss version of potato pancakes. I actually made them twice because my first attempt failed. This is really the simplest of recipes with just four ingredients: potatoes, salt, pepper, and the cooking oil. The potatoes are parboiled, cooled, then shredded. How could I mess this up, you might wonder. Well, I think the instructions are a little misleading. I quartered large baking potatoes. The recipe says that after boiling for 5 minutes, they should be just underdone. After 5 minutes, they were much closer to raw than to done, so I decided to cook them a little longer. At 10 minutes, they fit my description of just underdone. I set them aside to cool. Later, when I tried to grate them, they fell apart in my hand. I ended up turning them into mashed potatoes and calling it a night. On my second attempt, I drained and cooled the potatoes after they cooked for 5 minutes. I didn’t make a judgment call as to how done or underdone they were. In reality, the residual heat keeps on cooking the potatoes. Once cooled, they are much more cooked than when they come out of the pot, perfectly “just underdone”. This time, the potatoes grated easily. Shredded potatoes are tossed with salt and pepper. Then, handfuls of the potato mixture are fried in oil to make the laciest and crispiest potato pancakes. We loved them! 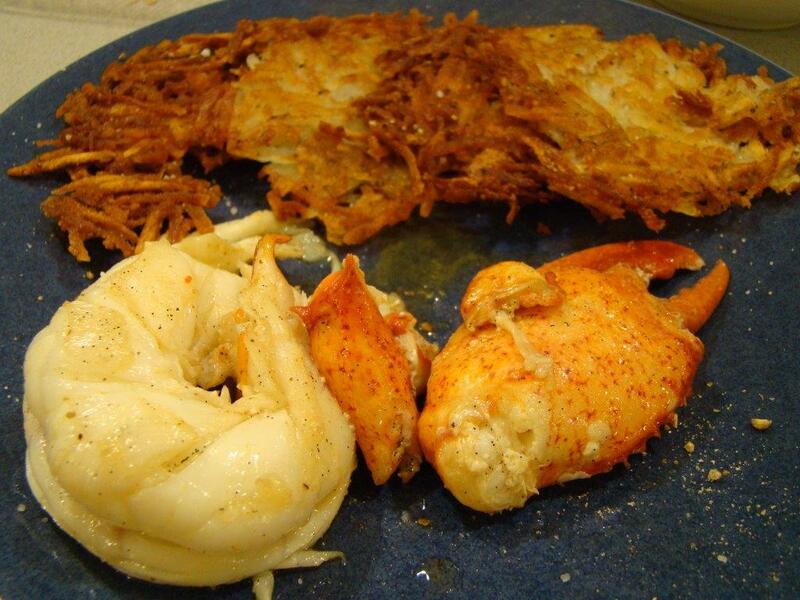 I am more accustomed to the potato latkes I make once a year for Hanukkah which start with raw potatoes and also include eggs and flour to bind them together. I enjoyed the lighter texture and pure potato flavor of the rösti. 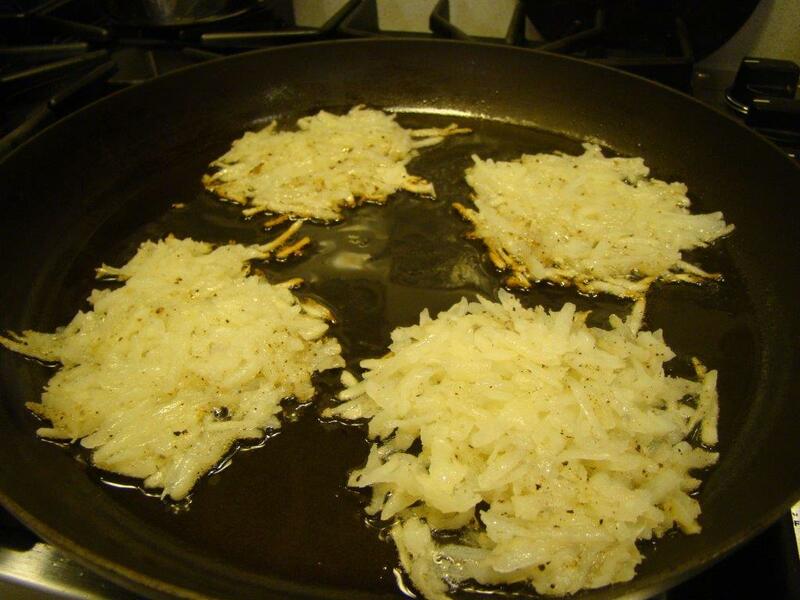 Like the latkes, these aren’t everyday fare, but rösti is definitely a new side dish I’ll add to my repertoire. Next up was Roasted Squash and Shallots with Merguez Chickpeas which makes an easy and hearty winter weeknight meal. Merguez is a heavily spiced North African sausage, usually made with lamb. This is a vegetarian cookbook, so sausage wasn’t an ingredient. For this recipe, the spice mixture takes its inspiration from merguez. 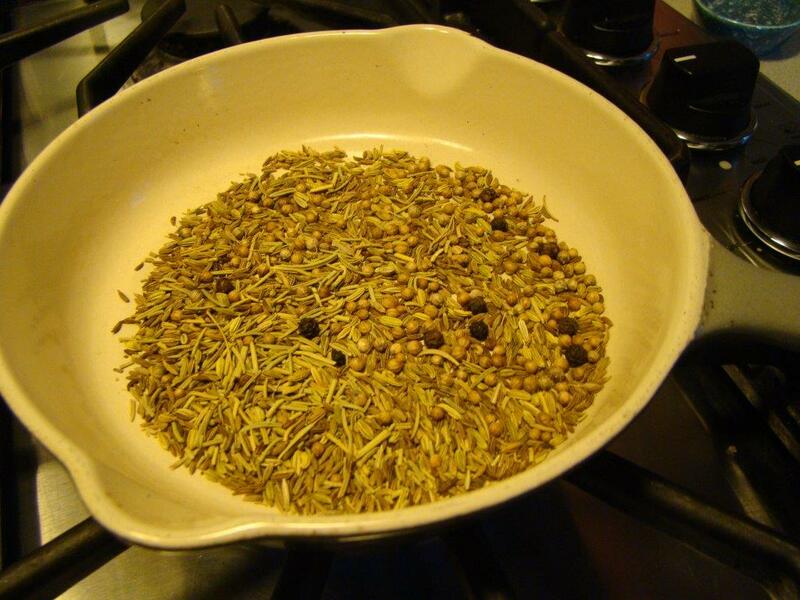 Coriander, cumin, fennel, and caraway seeds plus peppercorns are toasted in a skillet, then coarsely ground. The spice mixture is warmed rosemary, garlic, smoked paprika, cayenne, and salt in oil. Your house will fill with a wonderful aroma. Can you smell this toasting? In the meantime, cubes of butternut squash and halved shallots are roasted until tender. I didn’t have time to cook my own chickpeas, but canned worked out fine. To emulate drained freshly cooked chickpeas, I warmed the canned ones in some boiling water for a minute or two. To finish the dish, warm chickpeas are tossed in the spiced oil, then served over a bed of roasted squash and shallots sprinkled with chopped parsley. This is a winning dish. 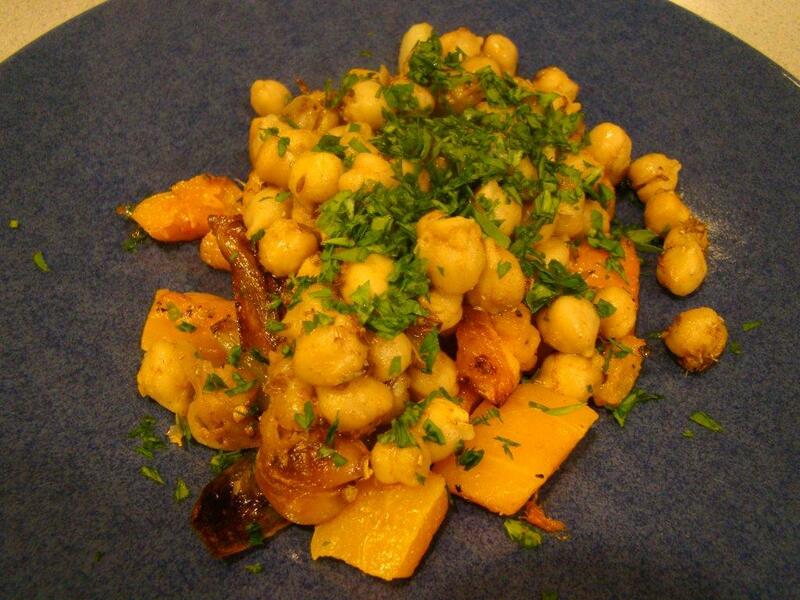 Both components of the dish (the roasted vegetables and the spiced chickpeas) could be prepared and served independently, making it versatile as well. This month has been a trip around the world, starting in Switzerland, moving on to North Africa, and ending in Mexico. For the last recipe I tried, I made Magic Bread Dough and formed it into flatbreads for Refried Beans Foldovers. The dough was easy to prepare, though too messy to get a photo because my hands weren’t clean enough to pick up the camera. After stirring water into the dry ingredients, there was still a lot of flour that didn’t incorporate. On faith, I dumped it all onto the counter and started kneading. After a few minutes, all the loose flour disappeared into the dough. Perhaps that’s why this is called Magic bread dough. My house is really cold right now (55°F during the day) which made me doubt the dough would rise much at room temperature. I took advantage of my oven’s proofing setting which holds the oven at a constant 100°F temperature. I let the dough rise for about 2 hours. It probably could have gone a little longer, but I was impatient. Then, I punched it down and divided the dough into 8 pieces that I rolled out into circles. My circles about 6 inches across, though I wish they had been a little bit bigger. The rolled out dough rests for five minutes and then gets cooked in a dry, very hot skillet to brown both sides. The flatbreads reminded me of pocketless pitas. We weren’t going to eat all the flatbreads at one meal, so I wrapped each one in a dishtowel and let them cool. Once cooled, I stored them (without the dishtowels) in a plastic bag, reheating before using them later. The flatbreads were the base for Refried Bean Foldovers which resemble a cross between a burrito and a pizza. The refried bean filling starts with sautéed onions and garlic. It being the dead of winter, I added canned diced tomatoes with their juices instead of grating fresh ones. Finally, a can of pinto beans is added and mashed for a spreadable consistency. 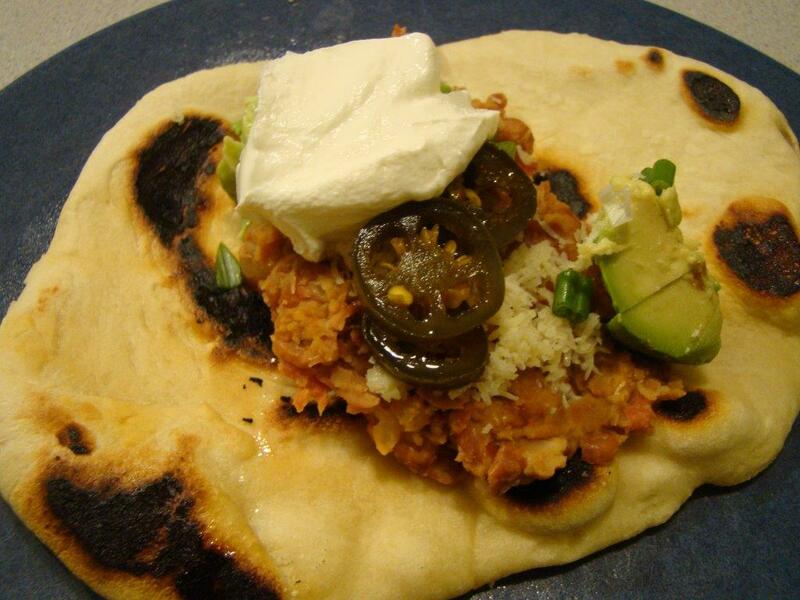 The foldover is assembled by spreading the refried beans on a warm flatbread then topping with sour cream and your choice of extra garnishes. I served with diced avocado, grated Cheddar cheese, diced scallions, and candied jalapenos. Fold and eat! This makes a tasty light dinner and an even better lunch. Now that I’m familiar with the foldover concept, I’m thinking that leftover Roasted Squash and Shallots with Merguez Chickpeas would make a delicious filling too. You can find the recipes in Hugh Fearnley-Whittingstall’s River Cottage Veg. To get reviews of other recipes the Cottage Cooking Club made in February, check out other posts here. I always find these reviews inspiring and add more recipes to my ever-growing “must cook” list. Posted on 1 March 2015, in Cottage Cooking Club and tagged beans, bread, chickpeas, Cottage Cooking Club, potatoes, winter squash. Bookmark the permalink. 8 Comments. and the recipe with the chickpeas sounds wonderful. The flatbread with its stuffing is so interesting. Great work, and fun to do in this miserable cold weather. I am making Madaleines as a make up, and cooking duck breast. Any use of the oven is quite welcome to heat the house. Hi Betsy, loved the potato technique, will be using that for now on. No one is ever late, that should never be a worry, so nice I had the opportunity to meet you! Betsy, great choices this month and we agree on all three of them. The Refried Beans Foldover with the flatbreads is amazing to say the least, cannot wait to make it again. The Rösti (as you already know) is a staple at our house and the Roasted Squash and Shallots with Merguez Chickpeas were happily gobbled up as well – you did a wonderful job with this post, great pictures, terrific descriptions and wonderful presentation all around. Funny thing about those potatoes – if I may, I will say that with Rösti it quite depends on the kind of potato that you are using – once you have found one that you can live with (taste and texture wise), stick with it if you can and then these will turn out perfect every time you make them. Hello Dear Betsy, another nice collection on this month’s River Cottage veg! I always enjoy reading your processes, and some of your honest tries, and outcomes, such as the first rosti, making your posts quite colorful, and not uncommonly putting a big smile on my face, along with a chuckle now and again. So happy you were pleased with the second try and this dish seems like a worthwhile try in this current month. I had also planned to prepare the magic bread, even emailing Cheri for the American book version flour types and amounts, but then, as you know got busy with the family members, still, it seems everyone enjoyed the flavor along with its outcome successfully orchestrated by all. So happy to know you and your blog through our CCC! See you over the month, keep warm, sending big hugs your way! Hi Betsy, oops I know that I commented already but I was trying to say previously was that it is no big deal about being late, sorry for the way it reads. My wording certainly does not sound right. I always enjoy your posts and the way you write. Have a great week! Look at that gorgeous lobster! Now that’s the way to serve rosti! I make latkes periodically too so the flavour of the rosti wasn’t new but the technique certainly was. I made the other dishes as well and enjoyed them. I love the toppings you chose for your foldover, especially the candied jalapenos – my daughter would love those! I skipped the cooking process of the potato. I had never done that in the past. I just kept thinking the potato would just crumble if cooked. Though I may try it again, out of curiosity. I will be making the foldover for our March selection. Thanks for posting the link for the candied jalapeños – sounds delish, and would make a great gift for my nephew who will be moving away next month. I’m sure the squash and shallots with merguez chickpeas would make a great filling for your foldover (though this one recipe did not do much for me), but I do make a chickpea taco that is tasty! Have a wonderful upcoming weekend, Betsy!